This past week was really tough. I had 7 days of jury duty, plus Yoga-urt, plus my job. Exhausting. Luckily, jury duty is over and I can get back to my normal crazy life! I’m spending a lot of time planning for our 1st Anniversary weekend in July, as well as planning for the Vegan Beer Fest in June. Both are super exciting for us but lots to organize so starting early. It’s all coming together though. As I plan for the anniversary weekend, the reminiscing continues. 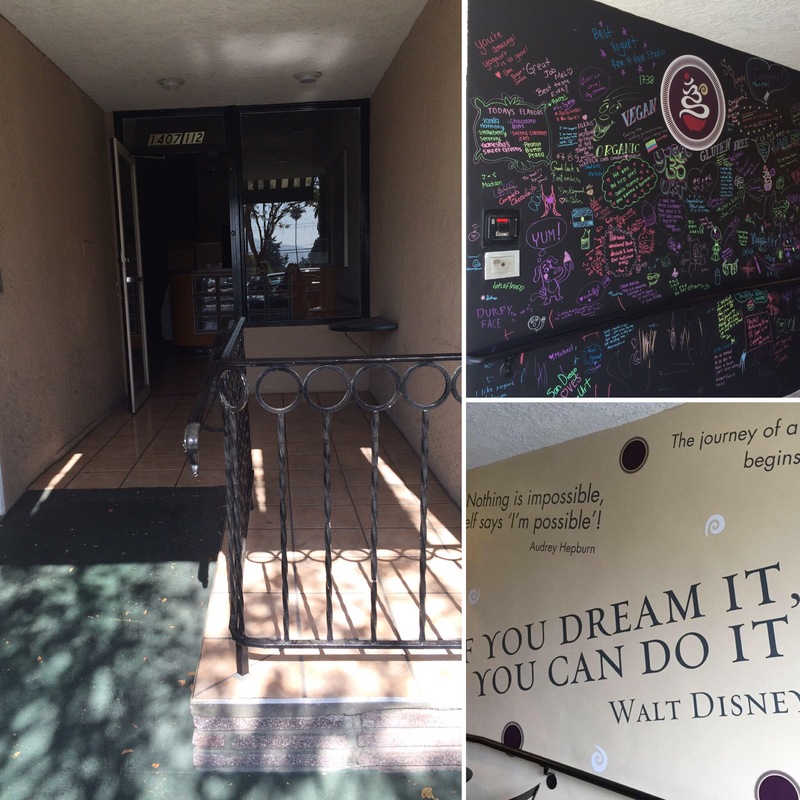 I posted last week on social media about the improvements we did to our entryway, with the “chalk wall” and “quote wall”. Like everything, there is a story there and it starts with my mom! One day I was at lunch with my parents and my mom said that I needed to do something colorful and exciting with that area, to pull people in. She was mentioning a few things that didn’t click with me, but she would not let go. I was making excuses of not having enough money, etc, but she kept going. So I started to think about what would grab people’s attention and still work for Yoga-urt’s branding and not cost a fortune. It was tricky because at the time, the walls were beige stucco. I went back to the chalk wall idea that I always had and then after some thinking, knew that I wanted to incorporate some inspirational quotes. I love quotes, so was hoping our customers would too. I didn’t want them to be corny, but I did want them to be meaningful. I want people to be inspired when they come to Yoga-urt. I hired a graphic artist to do many versions of what the entryway could look like, so I could see if it worked. 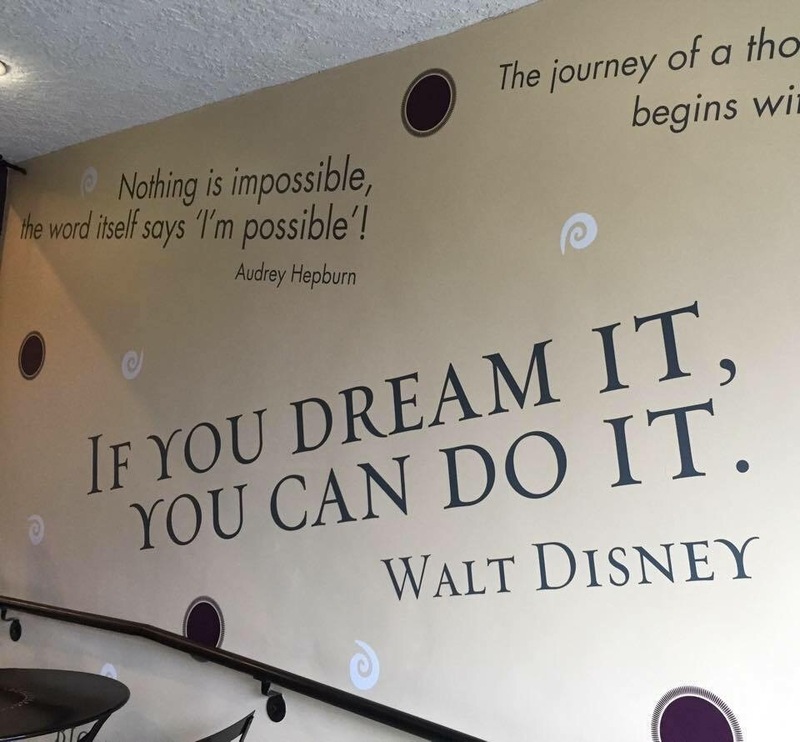 At one time, the quotes were on both walls, the ceiling, the floor, it got a little crazy. Then we pulled back and I’m so happy with the way it turned out. The entryway did go way over budget, as all of construction did, but at the end of the day it was worth it. 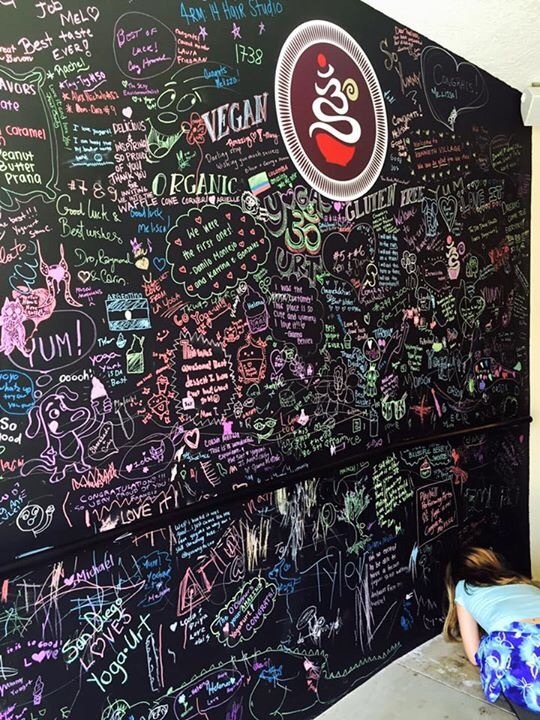 The first chalk wall was the cleanest and my favorite, but we try to make each one meaningful. There is a story with every part of Yoga-urt and I can’t believe our 1 year anniversary is coming!